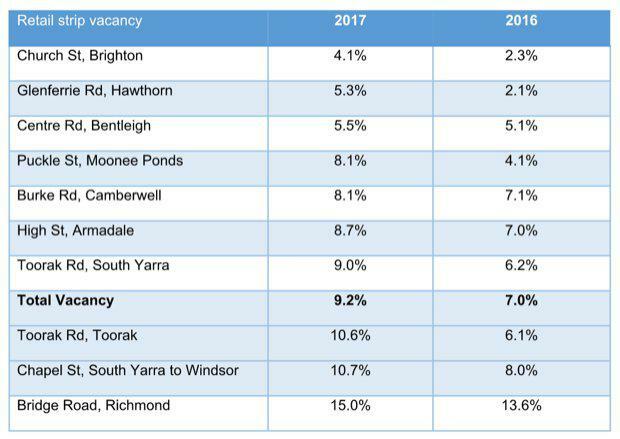 Total vacancy across Melbourne’s ten key retail strips is expected to recover on the back of growth in food services retailing, after a dramatic rise of seven per cent to 9.2 per cent, over the 12 months to April. Savills Associate Director Research Monica Mondkar said the strips had largely been impacted by falling consumer confidence and growing online sales, which had particularly impacted the fashion industry, however a surge in the number of café/food & groceries stores was expected to drive a vacancy recovery. "These figures are hardly surprising given the well-publicised woes of smaller retailers and recent figures which point to consumers holding tighter their purse strings as they battle mortgage and rental stress," she said. "While food and café and restaurant sectors have seen substantial growth, it is the fashion industry, along with a decline in household goods stores, that has been the key to the rise in vacancy. "She said vacancy was expected to steadily recover as the number of cafes, grocery stores and services continue to grow in line with the surge in Melbourne’s inner city population, filling vacancies left by fashion and household goods stores. ABS data showed Australian retail trade growth in the 12 months to March of 3.14 per cent, was the lowest since March 2012 at 2.55 per cent. Similarly Victorian retail trade growth in the 12 months to March (3.57%) was the lowest since March 2014 (3.46%). At the same time online retailing grew by nine per cent year-on-year to March with Australians spending $22.23 billion on online shopping. Viewed over the longer term – 2012 to 2017 - the research found of the 2618 shops surveyed, the Cafes, Restaurants and Takeaway Food Services category had seen the largest increase of 16 per cent from 484 shops to 581 shops, and Services was up 12 per cent - 545 to 609 shops - while Clothing, Footwear and Accessories saw a massive 27 per cent or 213 store decrease to 568 stores. Household goods also fell a notable 24 per cent. Ms Mondkar said the fashion decline has been a suburban phenomenon with Savills retail data showing a 17 per cent rise in the number of CBD fashion stores at the time of a 27 per cent decline over suburban strips, however the CBD gain could be explained by the influx of international brands over recent years especially at the new and refurbished shopping centres, Emporium and St Collins Lane. She said the reason for the fall in the number of household goods stores on suburban strips anecdotally reflected a preference for shopping at larger centres where parking and the number of stores provided accessibility, convenience and choice. Notable leases among the most popular fashion strips included Australian fashion designer Anna Hoffman, bridal jewellery designer Stephanie Brown and national fashion retailer Scanlan Theodre being the latest entrants opening up new stores along High Street Armadale where Clothing, Footwear and Personal Accessory retailing accounts for 32 per cent of stores. Church Street Brighton and Burke Road Camberwell, the two other high performing fashion strips, recorded fashion at 28 per cent and 27 per cent respectively, while, national retailers Wittner Shoes, Gorman and Nique opened up stores on Church Street Brighton and Zeira shoes and CUE leased new shops along Burke Road Camberwell. Ms Mondkar said yields and rents varied widely according to the particular attributes of the strip. 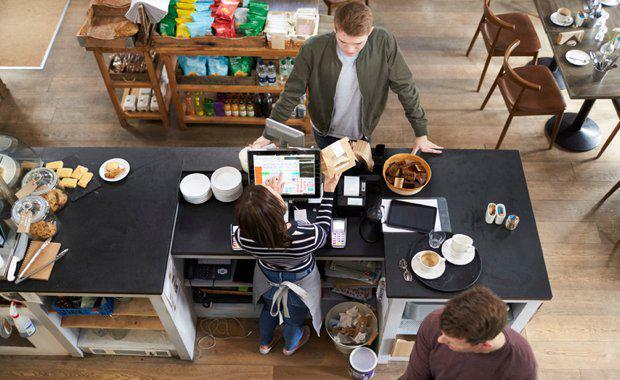 "Strip retail, especially suburban strip retail has long been a favourite of the small investor and in recent years that focus has intensified with the emergence of the SMSF and of course record low interest rates. "Yields have always been tight in these markets but those factors have seen even further downward pressure to the point where yields around 3.5 to 4.5 per cent are now much more common. "She said rents for strip shops in the best strip locations generally ranged between $800 and $1200 a square metre.